11-09-2007 - Metalpics 5th anniversary! For the today's 5th anniversary of Metalpics we came up with a special goodie: in collaboration with Sandro Klopfstein and Pixelpunishment we created an exclusive Metalpics anniversary shirt, printed in 40 copies only! The shirts are now available in M-XL for 15€ (excl. shipping) each, only while stocks last. For more of Sandro's work, check out Pixelpunishment or his MySpace profile. Many thanks for visiting Metalpics and for the strong support the last five years!!! 03-05-2007 - Preview to the festival season!!! Again, some amazing line-ups got arranged for the open airs this summer. In order to catch as many artists and locations as possible we had to take our choice, which wasn't easy. As every year, Metalpics.ch will join Tuska, Summer Breeze and Up From The Ground. Due to the great festival area and the atmosphere last year we just had to add Metalcamp to our "compulsory program" as well :). And finally, to spice up the combination we chose two new festivals: the Brutal Assault with its absolutely amazing line-up and the Evolution Festival, taking place in the lovely city of Florence. Subscribe to our newsletter so you wouldn't miss the soon coming summer special newsletters! Rock Sound Festival: Alice is coming! Only 55km away from the Metalpics.ch office 15 national and international bands such as Lordi, Hammerfall, Samael, Gotthard, Volbeat and the king of horror himself, Alice Cooper, will rock the stage on June 22nd and 23rd 2007 at Huttwil, Switzerland. We're not worthy! We're not worthy!!! Tuska Festival: Ten years of Koff, sun and Rock'n'Roll on three stages in the very heart of Helsinki! 32 artists during three days and for the night owls an exclusive program at the infamous evening clubs. Immortal, Blind Guardian, Emperor, WASP, Finntroll... Join the party from June 29th till July 2nd 2007. Check out pictures of the last three years here. Evolution Festival: Leaving the Lake of Garda, this year the Evolution Festival will take place in Florence, Italy, the beautiful city of Michelangelo's David and Ammanati's Neptun. Twelve great bands such as Behemoth, Kataklysm, Kamelot, Nevermore and Cynic will rock the stage at the Ippodromo della Mulina on July 7th 2007. Metalcamp: Taking place in a small paradise close to the Slovenian Alps, a national park located at the peninsula between the beautiful turquoise Soca and the Tolminka, the festival presents over 30 international acts on the Metal stage plus a collection of promising national and international (newcomer-)bands on the Talent stage. Motörhead, Immortal, Dismember, Unleashed and many more rocking from July 16th till 22nd 2007. Check out the pictures from Metalcamp 2006 here and the Metalcamp 2007 teaser at this location. Brutal Assault: One of the two pearls newly-discovered by Metalpics.ch! An exclusive area at an old army fortress in Jaromer, 130km east of Prague. Huge history and a unique atmosphere with over 40 bands such as Dismember, Pain, Katatonia, Suffocation and Cataract from August 9th till 11th 2007. Summer Breeze: For the second time the Breeze will blow through Dinkelsbuehl, a small city in the South of Germany. Celebrate the tenth anniversary of the greatest festival in Germany with 60 bands and additional performances on two stages and one party tent. 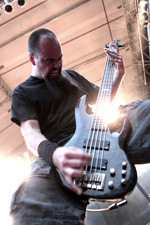 Soulfly, Necrophobic, Dark Tranquillity, Immolation, Dark Funeral and many more from August 16th till 18th 2007. Pictures from 2002-05 can be seen here and those from 2006 at this location. Up From The Ground: Small but powerful the UFTG is crowning the August with 26 bands on two days. Close to Frankfurt, in the grassland by the river Main the open air is blasting with acts such as Testament, Dying Fetus, Arch Enemy and Benediction from August 24th till 25th 2007. Check out the pictures of UFTG 2004-06 here. On March 31st, joined by Grand Magus, Candlemass celebrated their 20th anniversary with a big party at The Shrine in Stockholm, Sweden. Candlemass performed with seven different vocalists: Thomas Vikström (ex-Candlemass), Janne Christoffersson (Grand Magus, Spiritual Beggars), Mats Levén (Krux, Therion, ex-Yngwie Malmsteen), Mikael Åkerfeldt (Opeth), Robert Lowe (Candlemass, Solitude Aeternus) and Tony Martin (ex-Black Sabbath). Metalpics.ch joined the party and is proud to present pictures of the whole gig, now online here. Special thanks to Janne, Grand Magus and Leif, Candlemass for making it possible and for the great support!!! 30-01-2007 - Kataklysm "Live in Deutschland"
On January 26th Nuclear Blast has released the new Kataklysm DVD entitled "Live in Deutschland - The Devastation Begins". The DVD and the booklet/cover include pictures exclusively taken by Metalpics.ch at the Party.San Open Air 2006. For more details and the cover of the DVD check out Nuclear Blast or Kataklysm's official website. The pictures will be published on the DVD only! Live pics of Kataklysm taken at their european tour in January 2007 will be online here soon. Thanks for the big interest and all the emails!!! The right answer on the question who produced the new Legion Of The Damned album was of course Andy Classen (Stage One Studio). We congratulate Antoine from Eckwersheim, France for the right answer and the portion of luck!